Exclusive: The Kathleen Davies Mystery Solved! What Role Did Tom Wagner, The Delaware DOE, & The News Journal Play? 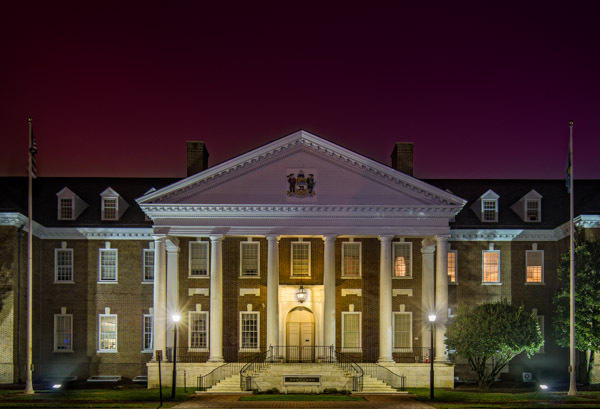 For over two years, Delaware citizens wondered why Kathleen Davies was put on leave by Delaware State Auditor Tom Wagner. Now, finally, the truth can be told. The News Journal article from the Summer of 2016, which gave a false picture of Davies’ administrative paid leave from the Office of the Auditor of Accounts, had very little basis in fact. Last week, Davies prevailed in an unemployment hearing against the Delaware Auditor of Accounts. The Referee’s Decision, seen below, shows a preponderance of evidence that Davies was put on leave without just cause and found the testimony from Wagner to contradict itself many times. One thing to keep in mind, while reading this post, is the Delaware Department of Education and the Office of the Auditor of Accounts is in the same building in Dover. The unemployment hearing was an appeal filed by Davies. 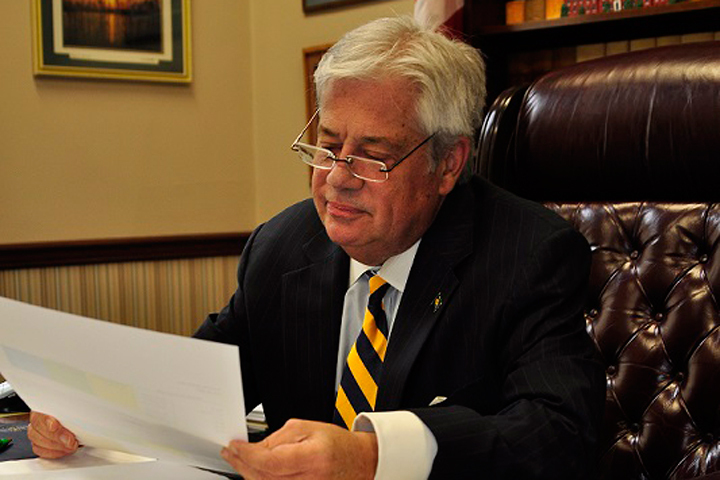 The claims deputy at the Department of Labor denied Davies’ request for unemployment. That decision was reversed at the May 22nd, 2018 hearing. As I suspected, the catalyst for Davies’ leave and eventual termination was the 2016 Statewide eSchoolPlus and Unit Count Performance Audit (UCPA). One of Davies’ subordinates claimed Davies was at fault for failing to adhere to the Generally Accepted Government Auditing Standards (GAGAS) and violated procedures from the Office of the Auditor of Accounts (OAOA). To wit, she claimed Davies sending State Representative Kim Williams a draft copy of the audit was against the rules. But the crucial facts are very clear- Wagner gave Davies a delegation of authority to take on his duties as State Auditor in the event of his absence from the office. The below decision states Wagner’s absence from the office happened frequently. As well, because Davies had that authority, sending Rep. Williams a draft copy was a part of the GAGAS guidelines because it gave more depth to the audit inspection report. The subordinate also claimed Davies attended an AFL-CIO conference in Pittsburg, PA without approval from Wagner. But evidence at the unemployment hearing showed Wagner gave Davies permission. The subordinate took it upon herself to conduct an investigation against Davies. At no point in time did the subordinate report her allegations against Davies to Wagner but, instead, went to the Office of Management and Budget which was run by former Director Ann Visalli. …testimony was rife with hearsay, speculation and subtle misleading representations of the contents of evidentiary documents and interpretations of policies and professional standards. In fact, the UCPA audit was the very first audit the subordinate was assigned to since she had just been promoted to the role of Audit Manager. The original UCPA audit came out on May 16th, 2017. The next day, Davies was placed on leave. The UCPA audit disappeared from the State Auditor website and a revised version came out four months later. This audit specifically dealt with many charter schools. The next month, Wagner did not release a report on a petty cash audit of several charter schools but instead issued various letters to charter schools. At the end of that July, the News Journal came out with an article alleging Davies had abused the reimbursement method for her travel expenses at the Auditor’s office. None of that was even mentioned in the report on the unemployment hearing with the exception of Wagner’s inability to answer questions about those policies. When the petty cash audit letters eventually came out, even the famous national education blogger Diane Ravitch wrote about it. In November 2015, OMB received written communication from state employees suggesting there was fraud and abuse to uncover in the auditor’s office. Then-OMB director Ann Visalli responded, and the employees sought and received whistleblower protection. The tips led OMB to investigate Davies and the Auditor of Accounts office. The sources, who provided evidence to the Office of Management and Budget, a state agency involved in the investigation, say Davies did not follow the approved practice of using a state-issued credit card, or PCard, to pay for hotel stays, travel and meals during trips on official state business. Hmm, sounds like the boys at the News Journal didn’t do a lot of digging before running with what amounted to be a blatantly false story about Davies. If Visali and Wagner wouldn’t comment on their story, their “sources” had to come from the Auditor’s office. But why were these “sources” so desperate for this information to get out while Wagner’s office was conducting an external investigation? Or were these sources outside of the Auditor’s office and, if so, how would they be privy to a personnel issue? Claimant’s Witness, the Auditor, was unable to recall pertinent information regarding the events resulting in the Claimant’s discharge. Although, he signed a six page letter on October 11, 2017 recommending the Claimant for discharge, the Auditor frequently responded, “I don’t know” to questions relating to the specifics regarding his discharge of the Claimant. There were times the Auditor would answer a question and then reverse his answer during an answer to a subsequent question resulting in confusing, circular testimony. This occurred repeatedly in response to questions regarding his oversight responsibilities of cash, travel and purchase card expenditures of the OAOA. In addition, the Auditor in his letter of October 11, 2017 appears to rely more heavily on the opinions, assertions, and allegations of the OAOA staff rather than on actual findings by Grant Thorton or on his own personal knowledge of events. It is undisputed that the Auditor was frequently absent from the office. It sounds to me like Davies, through Wagner’s own delegation of authority, has already functioned as the State Auditor. There is absolutely no reason why she should not be elected as State Auditor given she knows that office inside and out and has the qualifications to back it up. So we have the Delaware DOE’s thumbprint all over Davies’ leave two years ago. We have Tom Wagner sounding like a complete buffoon with how he handled this. Somehow, a subordinate was able to get Davies put on leave by leapfrogging to the Office of Management and Budget. At the time, Davies name was all over many education inspections, most dealing with charter schools. As a result of her reports, schools like Family Foundations Academy and Academy of Dover had their leaders eventually go to prison. In addition, the highly controversial charter school audit bill that pitted Rep. Williams against Senator David Sokola had been going on for months. I previously reported how a former Delaware DOE employee anonymously reached out to me following Davies’ termination and claimed she “had a falling out with Wagner“. Which means employees at the Delaware DOE were aware of things going on in the Auditor’s office. While I will not out this former DOE employee, I will say they were very involved with charter schools and, by default, had constant communication with Davies regarding charter school audits. In January of 2016, Davies issued an audit inspection dealing with the SEU (sustainable energy utility) revenue bonds that ticked off some in the state, including Visalli. Visalli resigned from her position as Director of OMB in mid-May of 2016 and didn’t even guide that office to the end of the fiscal year and the FY2017 state budget completion. In October of 2016, I posted a “Whodunnit” article on Davies’ leave. 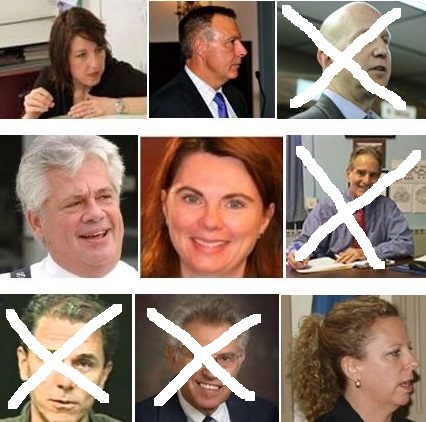 While some of my suspects have been eliminated, others haven’t. Given the nature of the below report, either there was collusion on many levels to get Davies ousted or Wagner didn’t have the first clue how to handle this. Or perhaps a combination of both. While the ultimate decision to place her on leave was Wagner himself, he did not follow any of the proper procedures in placing her on leave. On May 15th, a rabid supporter of Kathy McGuiness (also a candidate for State Auditor this year), publicly stated on Facebook that facts about Davies would come out very soon. Mitch Crane, a former state employee at the Division of Insurance, seemed to be in the know on knowledge about Davies. When called out on it, he would not comment other than to say Davies was running for State Auditor to seek revenge on Wagner. But Wagner is not running so this supposed motive of Crane’s is hearsay on it’s best day. He also indicated he had information that would cast Davies in a negative light and this information would come out in the next month. Since the only information to come out about Davies, as of this writing, is her well-earned appeals victory with the Department of Labor, I’m guessing Crane had inside knowledge about her case, most likely someone inside the Auditor’s office. Because he knew about Davies’ appeal process which was not public knowledge anywhere. In fact, I asked him about it. Sounds like a bad case of the gossip flu going around! 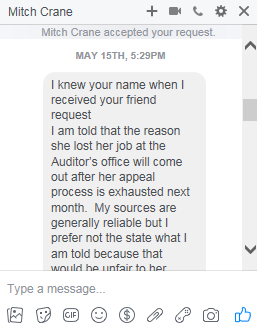 Crane’s “information” about a personnel issue within the Auditor’s office, while also being a fervent supporter of another candidate in the same election is not a coincidence in my opinion. Having that type of insight on a personnel issue is suspect. Politics, especially during an election season, can be nasty business. Attempting to trash another candidate but having it blow up in your face, that is irony! Editor’s Note: Davies is running for State Auditor and is facing a three-way primary along with candidates Dennis E. Williams and McGuiness. I have been very vocal in my support for Davies from the get-go based on her overwhelming qualifications. My conversation with Mitch Crane was a fishing expedition to see what he knew. This entry was posted in Kathleen Davies and tagged Ann Visali, DE Election 2018, DE State Auditor Tom Wagner, Delaware DOE, Delegation of Authority, Dennis E. Williams, Department of Labor, James Fisher, Kathleen Davies, Kathy McGuiness, Matthew Albright, Mitch Crane, News Journal, Office of Management and Budget, Referee's Decision, Subpoena, Unemployment Office, Witness by Kevin Ohlandt. Bookmark the permalink. Great reporting again. State government works like a sleazy who-dunn-it. Much like our current Govenor having to redact entire documents pertaining to who told him to abolish the bus hub at Rodney Square. Kathleen Davies won a victory at the Unemployment appeal. Nice for all of us that have lost rubber stamp appeals. Looking forward to Kathleen Davies being elected State Auditor.